Summer Day Adventures | Run, Lindsay, Run! It’s the weekend! But for me, my weekend began a day early. During the months of June, July and August my company lets us pick one day off per month to take as a ‘summer day’. With no real plans, I decided to take Friday (yesterday) off to relax! Thursday night felt like an adventure; since I didn’t have to wake up early for work or get in a run, I was happy to stay out and do whatever. I went with a group of friends to Mercury Bar in Murray Hill post-work to grab some food and drinks. We left around 9:30 and started walking back to the subway to go our respective ways. It was a nice night out, not too humid or cool, so I decided I might want to walk home. Yes, from 34th and 3rd, to the UWS. 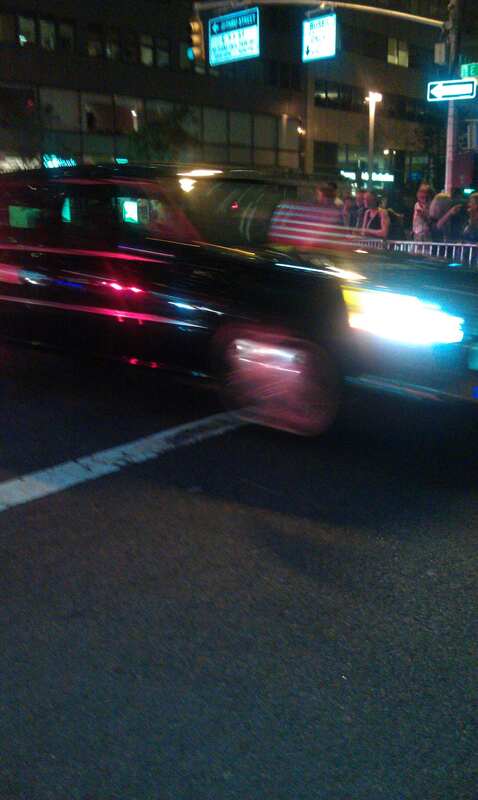 We just kept walking up 3rd and eventually hit 52nd street, where Obama’s motorcade was heading out of the city! We got held up for about 10 minutes, and kinda snuck a shot of his limo! At this point, two of my friends got on the subway to head back home. Three of us continued walking up 3rd, and decided that the beers and fried bar food weren’t enough. We needed ice cream! We made it our mission to walk to the 16 Handles on the Upper East Side. We finally arrived at 10:59, to find out they close at 11! They almost didn’t let us in, but we luckily were the last customers. I finally made it home around midnight and passed out full and happy after walking over 60 blocks uptown and from 2nd ave to Riverside Ave. I just mapped the entire evening was about 5.75 miles worth of walking. Felt good to just get out there and walk! I kicked off my summer day off by sleeping in until 11:30am (amazing!). It was not the nicest day in NYC, kinda rainy, humid and overcast. I had originally planned to lay out in Central Park with a book and get a tan, but that was not in the cards today. It ended up being for the best, because I didn’t feel guilty in the slightest for sleeping in and laying in bed a bit. After breakfast in bed, I decided it was time for a run. I headed to Central Park for a favorite weekend route, a full outer loop of the park- plus some add ons to/from my apartment is about 8 miles. Despite the humidity (I was so sweaty it may as well have been raining), it was an awesome run! I felt really strong and was able to pick it up at the end, and was my longest run since the Mini 10K! The only thing I’ve noticed with my Garmin is that my first mile is always a bit off because of the poor satellite reception amidst the tall buildings until I get into the park. 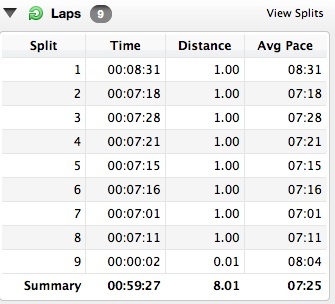 See how my pace is all wacky? Does this happen to any other NYC-ers? I always wait to start my run until I find a good satellite reception, but this happens quite often and it frustrates me since I know I am running faster and I’ve gone more than a mile by the time it hits the mile mark. I know tall city buildings are likely the cause, but…annoying. 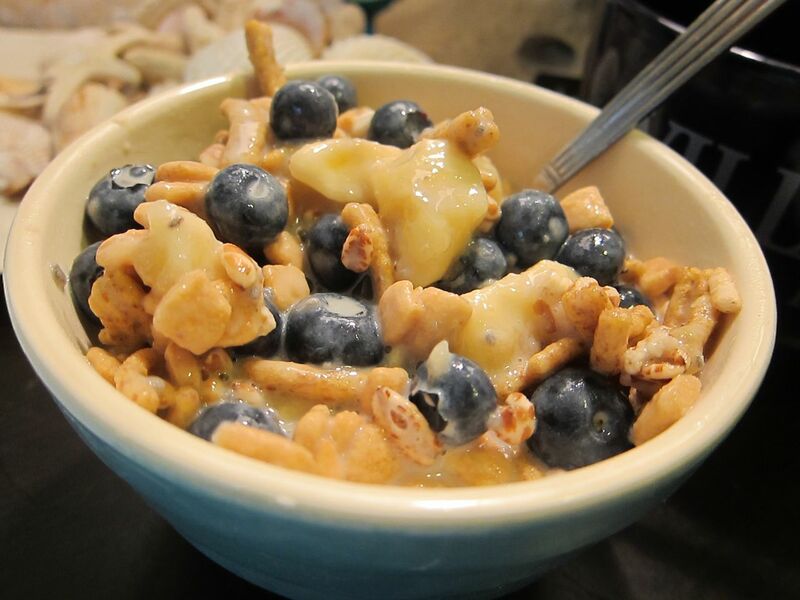 After my run, I refueled with breakfast part 2! I spend the rest of the day lounging around the apartment more, and finally decided that one night at 16 Handles was not enough. I had to return! The Upper West Side store was celebrating their ‘Grand Opening’ (even though they’ve been open about 2 months now) with 16% off! This delicious creation may or may not have cost about $8. I also decided I didn’t quite do enough walking last night, so I walked all the way across town to Target, fueled by the sugary goodness of 16 Handles. What can I say, Target is a city girl’s wonderland. Now if I only had a car, so I didn’t have to carry it all home. 🙂 Okay, I took the bus most of the way home because the bags were heavy and my feet were tired. How do you spend your days off from work/school/etc.? Do you tend to be super productive, or lounge around and do nothing? And, if you have a Garmin in the city, do you have any issues with satellite? I am EXTREMELY jealous of the “summer days off.” Everywhere should implement this, as well as an afternoon siesta like the Spaniards/Mexicans. I’m thinking of getting the nike GPS watch. Right now I’m using my sportband so no satellite issues. I keep sleeping in while I’m at home and running mid-day, which is stupid because thats the hottest part of the day, but I tell myself its good for “heat tolerance training.” Sure…. I live about a mile from the park and I usually don’t even start my Garmin until I get to the park bc it is all weird and usually doesn’t even find a satellite. I guess that is what I get for living in midtown! ha! 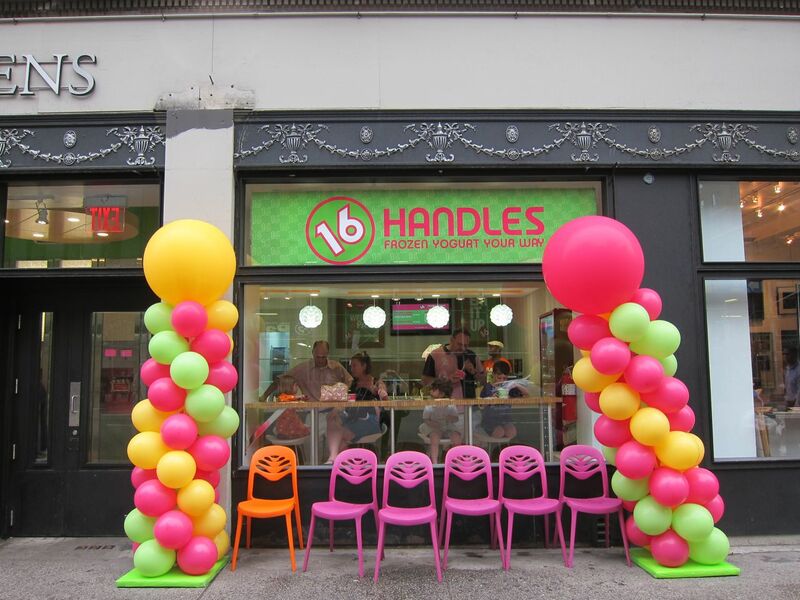 I may or may not have spent $8 at 16 Handles recently too. hmmf. 🙂 I love being productive on my days off, but getting some relaxing me time in too, and would probably do something similar to what you did! I can’t get enough of that Target. I love walking all over the city! I’ll often walk instead of taking the subway…let’s face it, sometimes it doesn’t talk all that much longer to walk! 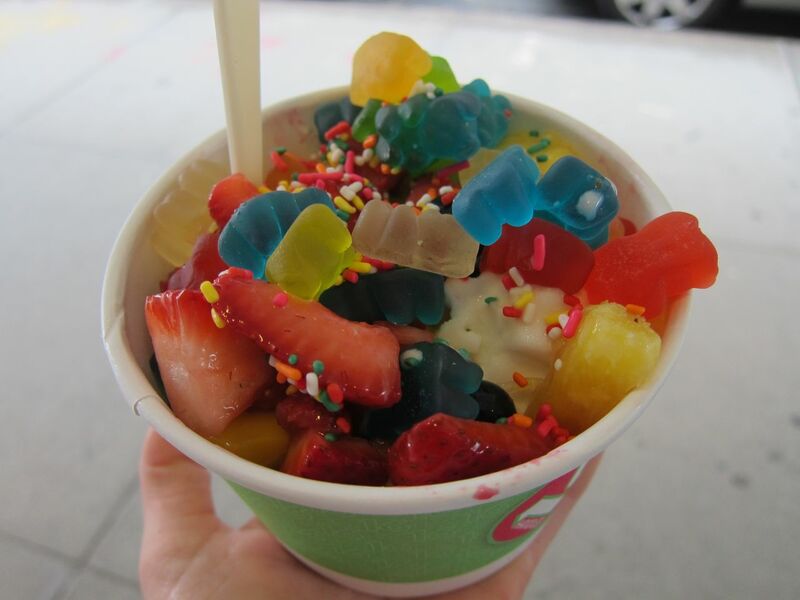 (Especially if it involves the crosstown bus…) And 16 Handles just makes it that much better! My Garmin does okay in the city…it’s certainly not perfect, and sometimes it gets messed up on the UES before the park. I know about how far it is to the park from my apartment (thanks, gmap pedometer! ), so I base mileage off of that if it’s really wacky. I have so many problems with my Garmin, and it’s brand-new. It makes me a little sad that it’s so hard to find satellite reception (twice recently I’ve had to start races without the satellite on, because it couldn’t get reception in the 15 minutes beforehand). During the times it does work though, it’s exhilarating to have all of that information at your hands! Take Me To The Vino! « Run, Lindsay, Run!